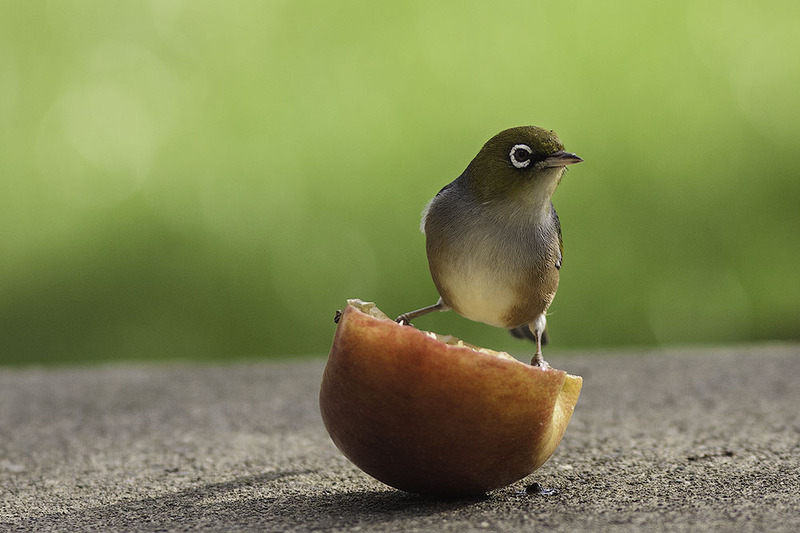 The silvereye is frequently seen in our garden here in New Zealand. These tiny birds enjoy feasting on ripe fruit on the small trees, as well as apples we leave on the ground for them in winter. Growing to around 12cms, the silvereye is a little larger than the Eurasian wren, and has a distinctive circle of white feathers around the eye. Overall, silvereye feathers are light greenish with blue-grey across the back and creamy white on the breast. This handsome little bird is now widespread in the south-west Pacific, and probably arrived in New Zealand from Tasmania. The silvereye favours small trees and shrubs, making it easy to spot in woodland, orchards, parks, and gardens. As well as fruit, silvereye eat nectar, spiders, and insects. The silvereye mates for life. Nesting starts in October, and three eggs are the norm. Within 24 days, a young silvereye fledges, increasing the population of this popular garden visitor!